At the supermarket. Chanel A/W 2014 Le Grand Palais, Paris 4 March 2014. Marion Hume is a fashion editor and ethical strategist based in London. 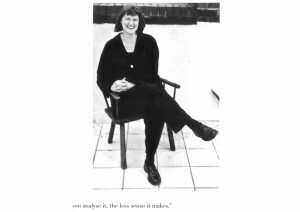 Since 1985, she has written for newspapers and magazines in the US, the UK, Australia, around the world and online. 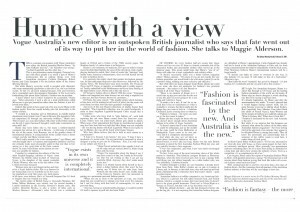 Since 2006, Hume has been the International Fashion Editor for The Australian Financial Review (AFR). Her in-depth profiles include fashion’s leading creatives and business titans. USA: Hume’s American career began in 1994 with a profile of Vivienne Westwood for Vogue. 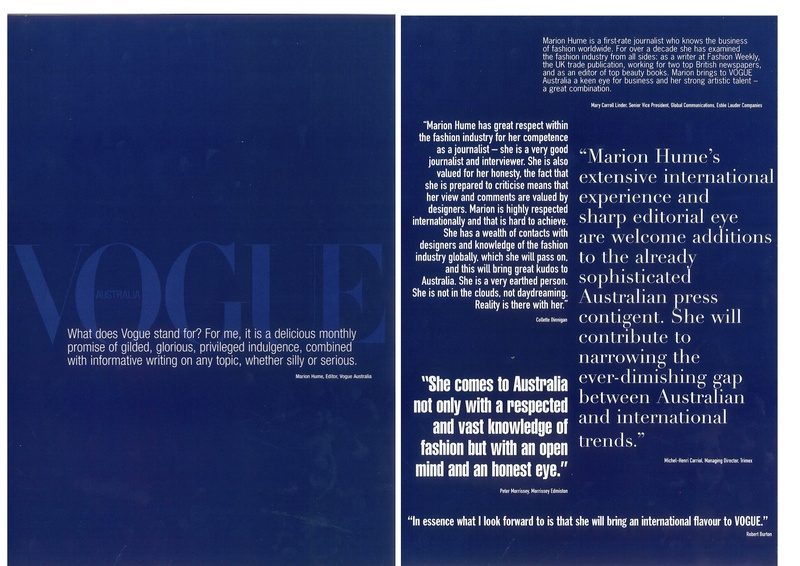 This lead to a contributing editor’s contract, until 1998, when she joined Harper’s Bazaar. From 2001-2008, she was a contributing editor at TIME Magazine, Style & Design. She has written for Vanity Fair, The New York Times, The New York Observer, Departures, W and wrote the “Letter from London” blog for forbes.com. UK: Hume has contributed to The Financial Times, The Daily Telegraph, The Saturday Telegraph Magazine, The Times, The Observer and The Guardian. UK magazines range from The Gentlewoman to Elle. She writes online for The Business of Fashion. She was fashion editor of The Independent from 1992 to 1995. 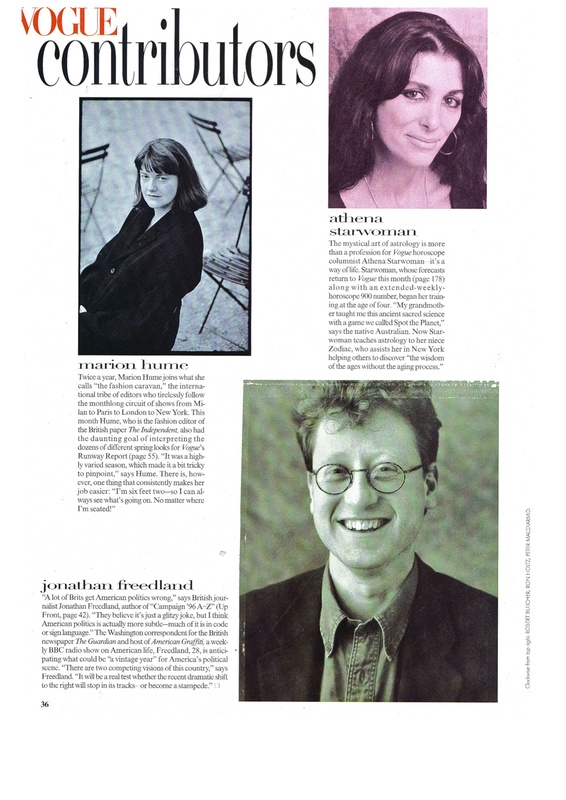 She was the fashion writer at the FT from 1996-97. Her writing career began when she won the Honey Magazine Young Journalist of the Year competition in 1985. 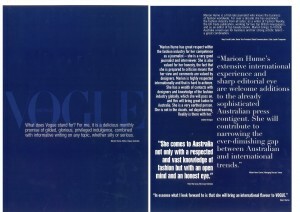 Australia: In 1997, Hume was named editor of Vogue Australia. 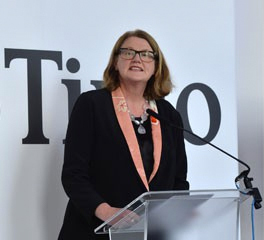 In 1998, she joined News Ltd before moving to Fairfax Media Ltd in 2001 for which, in addition to the AFR, she interviews movie and sports stars for Sunday Life Magazine. 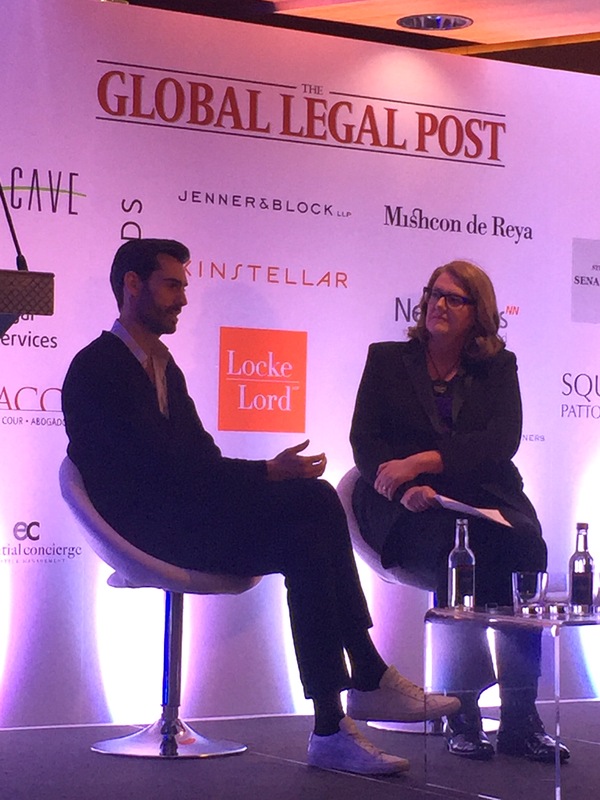 Hume is the curator and co-host of the Luxury Law Summit, the leading international event for lawyers and C-Suite executives in London each May. Marion on stage with Founder & CEO of Lyst, Chris Morton, at the Luxury Law Summit at the Four Seasons Hotel in London, 17 May 2016. At the Sydney Opera House in May 2013, Hume curated and helmed Bespoke, a celebration of creative collaboration which attracted speakers from around the world. Hume’s speaking assignments have included The National Gallery of Victoria, Melbourne and The Barbican, London. 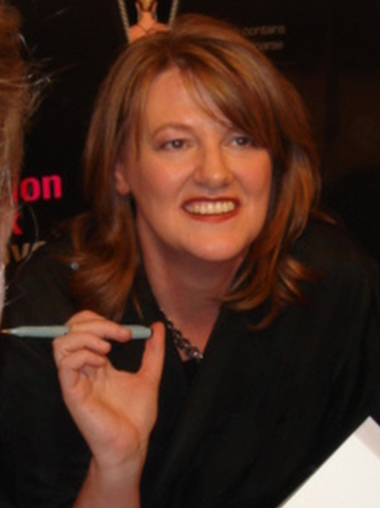 For several years, she chaired the business seminars of Melbourne Fashion Festival. Marion speaking at the Bespoke Summit at The Sydney Opera House, 16 May 2013. Hume is a consultant for Paris Cherie, which links young women across China to the dream of Paris luxury shopping. She was a founding partner of the travel website runawaynow.com. She was instrumental in establishing and maintaining the social media strategy of the United Nations’ ITC Ethical Fashion Initiative. Hume is a regular guest on SHOWStudio’s digital platform. She was the series consultant for the 1992 BBC six-part fashion series, The Look. She was the writer and associate producer of The South Bank Show special on John Galliano (1997). She has worked as content director/producer on many video clips for the United Nations’ ITC Ethical Fashion Initiative. Hume is the co author with Philip Treacy of the hat designer’s best selling monograph for Rizzoli (2015). She has contributed to many books including The Cutting Edge (Victoria and Albert Museum, 1994) and collaborated on the V&A exhibition of the same name as well as the Victoria and Albert Museum’s Streetstyle (1995). Hume’s novel, The Fashion Pack was published by Penguin (2005). Hume is currently working on a significant fund raising initiative. Under the auspices of United Nations Foundation, she worked with Project Perpetual which raised US$5.7 million in a single night to benefit shot@life, which is supported by the Bill & Melinda Gates Foundation and works in association with WHO, UNICEF and GAVI to deliver global childhood vaccines. From 2009 to 2014, Hume was International Consultant, then Senior Consultant, for The United Nations’ ITC Ethical Fashion Initiative. 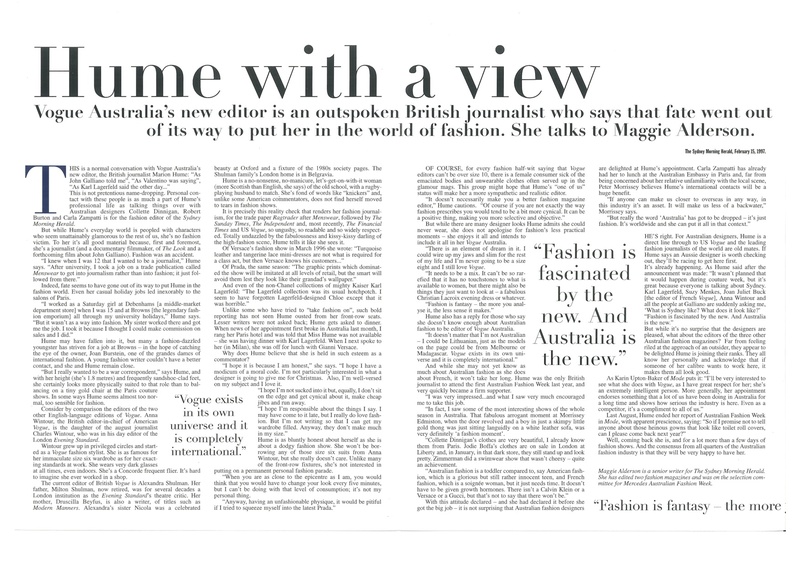 The bridge between fashion and development, Hume was instrumental in delivering the vision of founder, Simone Cipriani to connect marginalized artisans to top designers including Vivienne Westwood, Christian Louboutin, Stella McCartney, sass & bide, Karen Walker and Stella Jean. She orchestrated a media strategy which resulted in features in The Economist, US and global editions of Vogue, Harper’s Bazaar, the International New York Times, among others. A lifelong activist, in 1988, Hume co-founded Fashion Acts raising funds for the fight against HIV/AIDS. Hume has dual British and Australian citizenship. A graduate of Exeter University, she resides in London with her husband, photographer, Peter Hunt.